Your Monograms Machu Picchu vacation package delivers everything you need to experience this ancient site and the age-old culture of the Sacred Valley. You’ll be greeted by your Local Host as you arrive in Cusco, and enjoy lunch and a private tour through Urubamba Valley and the Sacred Valley of the Incas. Browse the exquisite, hand-woven textiles, rugs, alpaca sweaters, and handmade Peruvian jewelry found at Pisac Market before visiting Ollantaytambo to see fine examples of Incan building and masonry. Board the Vistadome Train for Aguas Calientes—at the foot of the mountain where Machu Picchu remains as the “Lost City of the Incas.” You’ll ascend to the ruins high above the steep valley and tropical jungle for a guided tour of this fascinating site. See the temple ruins, holy houses, and mile-long aqueduct along with your expert Local Guide to bring the mysteries of pre-Columbian Machu Picchu to life. Return to Cusco for a day of leisure to explore sites of Incan and Spanish history. Your Peru trip to Machu Picchu is a once-in-a-lifetime experience shared with the expertise and ease as only Monograms can! Explore some of the most famous ruins in the world, Machu Picchu, in this Monograms vacation. Your expert guide will introduce this mysterious ancient citadel and show you some of the best places for photo opportunities during your included tour! Arrive in Cusco where you will be met by your Local Host. 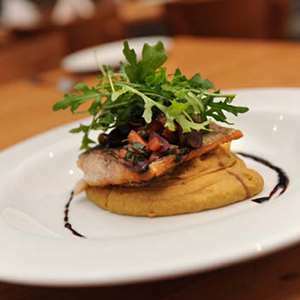 Together, embark on a PRIVATE TOUR into the Urubamba Valley and the Sacred Valley of the Incas for lunch. Visit the market town of PISAC, where you can buy handmade rugs, alpaca sweaters, and jewelry at bargain prices. At the other end of the valley, visit OLLANTAYTAMBO to see some of the finest examples of Inca masonry. Stay overnight in the Sacred Valley. This morning, transfer to the Ollanta train station where you will board the Vistadome TRAIN for a short journey through the lush Urubamba Valley to Aguas Calientes, the town at the base of the mountain where MACHU PICCHU, the “Lost City of the Incas,” is located. Upon arrival, transfer to a motorcoach for the ascent to the legendary ruins high above the steep valley overlaid with dense tropical jungle. On a GUIDED TOUR, explore this intact fortress with its temple remains, holy houses, and mile-long aqueduct. Your Local Guide will bring you closer to the lives and mysteries still hidden in these amazing structures built by the Pre-Columbian masters of this sacred land. 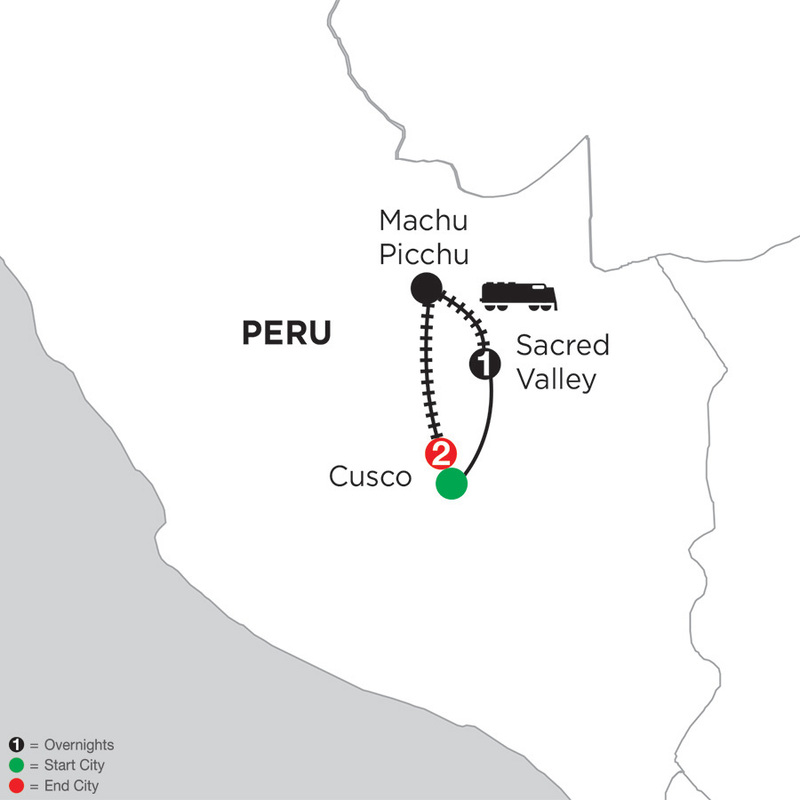 Later this afternoon, return by train to Cusco, the ancient capital of the Incas. Enjoy a full day at leisure to explore the city of Cusco. Perhaps take an optional walking tour to learn more about the Incas and their struggle against invading Spaniards. Visits include the imposing Cathedral and the Inca Temple of the Sun, Koricancha, which became the Spaniards’ Santo Domingo Monastery. Enjoya city tour of Cusco including the region¿s most important landmarks of both the Inca and Colonial times. Visit the sites of Korikancha, Plaza de Armas, Sacsayhuaman, Kenko, Puca Pucara, and Tambomachay.